Documentary film Honour Before Glory travels the valiant road of the Number Two Construction Battalion. When it comes to naming our country’s World War I military heroes, many of us would be hard pressed to come up with one name, let alone the name of one black officer. Anthony Sherwood’s hour-long documentary film Honour Before Glory, which was originally produced in 2000 and won both a Gemini and a Hollywood Black Film Festival Award, will forever change that. President of Black History Month, Michael Farkas, and Anthony Sherwood. Honour Before Glory: A still from Honour Before Glory, which explores both race and the military within Canada. Sherwood, who wrote, produced, directed and starred in some of the film’s dramatized scenes, shares the poignant and viscerally gripping writings of Captain William White, the first black commissioned officer who served in the British Armed Forces. Captain White was not only the chaplain of the first-ever all-black Canadian military battalion, he was also Sherwood’s great-uncle. By way of Sherwood’s melodic narration, the film vividly brings to life the subtle and not so subtle racism that permeated every area of daily life in Canadian society during those days. White’s handwritten diary is the only account of what life was like for the battalion at the time. He alludes to the white-only restaurants, schools, theatre sections and even cemeteries, which divided black citizens from their neighbours. Nevertheless, Captain White, like many other black Canadians of Nova Scotia in 1915, knew that his country was at war and wanted to serve in the military, but was unable to do so because of the government’s restrictive white-only policy. Sherwood explains what motivated these soldiers to enlist given the oppressive conditions they lived under. Despite the discrimination, Captain White, who got widespread support from community groups and leaders across Nova Scotia, petitioned the government and wrote a letter to prime minister Robert Borden for permission to enlist. Over time, the prime minister relented and by July 16, 1916 the Number Two Construction Battalion (also known as The Black Battalion) was formed in Pictou, Nova Scotia. Captain White, along with several young black men, eagerly signed up to serve. Men had to be at least 18 years of age in order to be in the military, but many were so determined to enlist that they lied about their age. Sherwood interviewed family members of the soldiers, who recount on screen how their ancestors only managed to pass the legal requirement because there was little in the way of documentation or birth certificates. Several men who served were as young as 15 years of age. But the Number Two Battalion was to face far worse battles than they did at home. Although they were victorious by becoming a unit, they bonded with each other because the other units did not want to serve alongside them. Besides, the Number Two was allowed to enlist, but not allowed to fight. The battalion was shipped overseas to the mountainous regions of France to cut lumber, dig trenches and build huts. Sherwood describes the misery of the men who would work all day and night in rain and snow, many of them collapsing under the strain. Pneumonia and influenza took many lives. The battalion was treated as an afterthought—they were the last to receive basic supplies such as underclothing and socks. As a result, many of the men developed severe blisters which made it even more difficult to work long hours in the frigid temperatures. 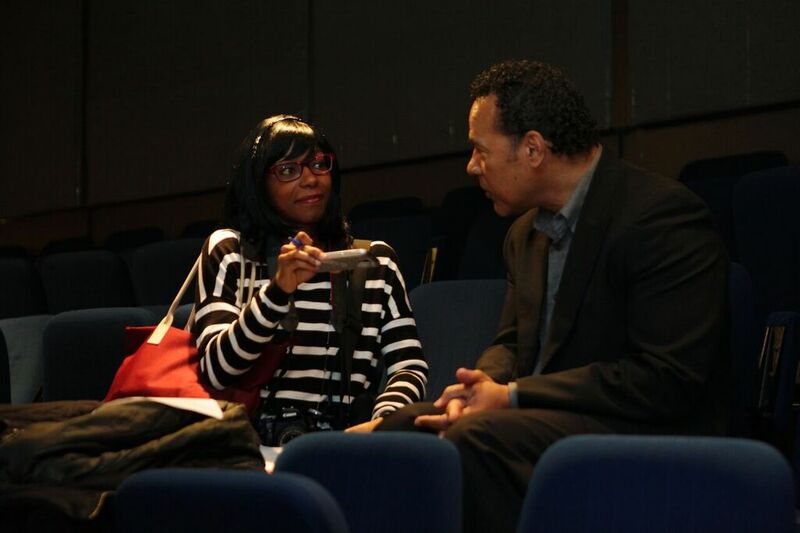 The Concordian’s reporter, Marcelline Selman, interviewing Anthony Sherwood. Sherwood is enigmatic playing the role of his great-uncle and deftly captures the Baptist-influenced cadence, delivering each line with palpable conviction. Sherwood’s skilled direction displays the multifaceted character of Captain White’s pride as a Canadian soldier. His acute homesickness from being away from his wife and five children and his frustrations with the living conditions are all portrayed in the documentary. Sherwood’s nuanced performance as Captain White in reconstructed scenes shows his weariness of the racism he witnessed and suffered each day in the army, which is underscored with a quiet dignity throughout. But the film plays out the whole history of the battalion’s trials and eventual triumph, along with some serendipitous surprises such as the discovery that the doctor of the battalion was directly related to a family friend.